This week, we turn your attention to an overlooked and neglected disease that deserves a closer look. Contributing author Julia Hill is an MPH student at the Gillings School of Global Public Health at UNC Chapel Hill. In the United States, deaths due to Hepatitis C outnumber deaths caused by HIV, and yet, it’s not something that we hear much about. According to the CDC, chronic Hepatitis C is the most common blood-borne infectious disease, affecting approximately 3.2 million Americans. Unlike Hepatitis A and B, there is no vaccine for the Hepatitis C virus. Once contracted, Hepatitis C often becomes a chronic condition. Over the course of decades, Hepatitis C gradually damages the liver, eventually causing organ failure or cancer, leading ultimately to liver transplantation or death. Jewels Rhode is a second year MPH student in the Department of Health Behavior at the Gillings School of Global Public Health at UNC Chapel Hill. For her practicum last summer, she traveled to Cape Town, South Africa, where she worked with the South African Medical Research Council (MRC) on examining the treatment and disease experiences of people with co-morbid HIV and chronic illness. There are about 6.4 million people living with HIV in South Africa (Shisana et al., 2014). South Africa has the largest public sector antiretroviral (ART) program in the world, providing HIV treatment to 2.4 million children and adults living with HIV (32% of the population) (Shisana et al., 2014). As a result of their expansive ART program, South Africans are now living longer with HIV; however, the success of this program has introduced a new health concern with the rise of co-morbid HIV and chronic illnesses (Bradshaw, Steyn, Levitt, & Nojilana, 2014). In advance of next week’s webinar (Thursday, January 30) on the use of Motivation Interviewing in peer support for persons living with HIV, this blog highlights some recent research and support programs for those living with HIV/AIDs. In research, there have been several positive findings for the role of peers in HIV prevention and for those living with HIV/AIDS. 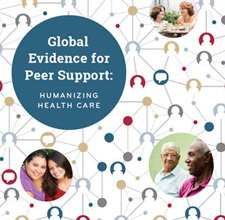 Medley and Colleagues conducted a systematic review that included 30 studies of peer education programs for HIV prevention. The author’s concluded the peer education interventions were significantly associated with increased HIV knowledge, reduced equipment sharing, and increased condom usage. You have successfully subscribed to the Peers for Progress Newsletter. To unsubscribe, click the unsubscribe link at the bottom of any e-Newsletter email. We're sorry but there was a problem processesing your submission. Please try submitting again. If the problem persists, please contact us. Please use this form to be added to the Peers for Progress e-Newsletter mailing list. Be the first to receive the latest news and resources on program development, state-of-the-art research, and networking opportunities. Previous newsletters may be found at News & Events > Peers for Progress Newsletters.